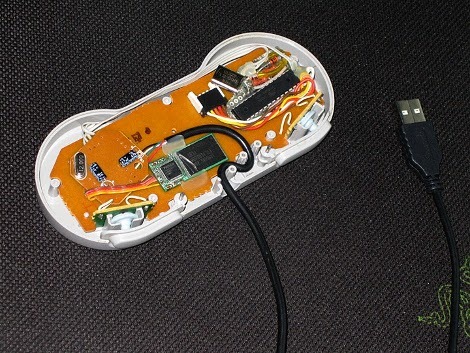 Here’s another SNES controller converted to house a USB system. The one we saw last time used a kit as an adapter for the controller but this version uses a home-built PCB and an ATmega8 microcontroller with the latest revision of an open source adapter for NES and SNES controllers. As you can see after the break, [Atarity] built the adapter, then added it along with a USB hub and thumb drive so that he could run a copy of XBMC from the controller. Now he’s got XBMC as a way to launch emulators for those classic games, as well as play traditional media. You will be seeing more of this type of mod soon. We were tipped off that an in-depth tutorial for SNES controller hacking is on its way, although that is unrelated to [Atarity’s] work. Reading the headline I thought that this was a controller that contained it’s own XBMC platform (like plug into TV and go). This is still cool though. Cool! But a pretty weak video demo. @Dan: I thought the same thing too. Would have been awesome, but would probably require some additional space for electronics, unless you can cram something powerful enough into the SNES controller.. Now an Xbox controller? Now we’re talking! I have to agree, the title is pretty misleading. I never thought he’d be able to fit the whole XBox circuitry and storage and controller into that case, but at least I thought it would run on an XBox. Otherwise it’s not really XBMC, it’s Media Center on a PC with an XBMC skin. Even reading the actual post it sounds like the controller itself runs XBMC…. Maybe if a really small motherboard could fit into a Gamecube and run XBMC using the original controllers, that would be cool. At least, a few orders of magnitue cooler than this. It could easily be configured to run XBMC Live, so I don’t think the story is misleading. A plug and play system for TVs would be cool though. Took me a while to understand what the controller actually does. The article is worded horribly, and the title is flat out misleading. The controller only acts as an HID and a filesystem for storing a bootable media center. What’s the hype with XBMC? I really don’t get it. It crashes frequently on ubuntu (9.10 and 10.04) and really doesn’t do anything that special. What am I missing here? What’s with the hype for XBMC? XBMC no longer stands for xbox media center as it has been ported to linux,mac, and windows as well. That’s nice and all but what he should have installed on this is note XBMC but HyperSpin (http://hyperspin-fe.com/). Now that’s a front end for Launching Emulators! And yes — it’s XBMC on my pad. And it’s possible to make it bootable. Had me with the controller project. Love the idea of XBMC as a dashboard for the emulators. Lost me with the Razer mouse pad. Please tell me you didn’t pay for that. @ Steve: Really are you on 64 or 32 bit? I have never had a single issue on my Ubuntu builds (8.04-9.04). @Thanice: surprised to see another HyperSpin user on here! I’ve done this with an NES controller too. Nothing special, stick a usb hub in the controller- then solder the buttons to a usb keyboard encoder and plug that in the hub. Then get a flash drive and plug that in the hub. Mr_Bishop, currently 64-bit. But since I don’t do anything that heavy, I might just switch to 32 for better compatibility. But even if XBMC didn’t keep crashing, I’m finding it hard seeing what benefit it has over well labelled folders. It grabs fan art which is nice but only if you go into a mode which shows movies and hides TV shoes, what’s that about. It regularly forgets what I have or haven’t started watching and is just generally not that amazing. I’m really looking for more from it because everyone raves about it and I honestly do want a ‘next generation’ media handler/player.